I thought I would share a few of the most basic, and really the only, cooking utensils you really need when cooking during an emergency or disaster. During a “grid-down” event these would be the only ones needed period. Have too many and you get overloaded and tied down. Stay lean & mean with your gear. Simple is a wonderful thing. #1 Basic Cooking Utensil – griddle. This is one of my favorite pieces of cooking paraphernalia; but not your average Teflon-coated puny light-weight griddle. I am talking a full 11-½”x 16” heavy duty 1½” deep griddle! It is the bottom part of a Wear-Ever No. 818 roaster pan with lid. • Not big enough. Simply not enough room for the big pancakes I love, or enough for all the bacon. I want plenty of cooking surface. • Not deep enough. I can’t tell you the number of times I have “rolled” something off a griddle. I hate that! And then the next worst thing – having grease flow off the griddle onto the stove or into a burner. I want the griddle plenty deep enough to keep what is on the griddle from jumping ship! • Teflon coating. Outdoor cooking has no room for, or tolerance for, Teflon of any kind. There are a million ways to ruin the surface and ZERO ways to repair or restore it. I am “old school”, I learned back in Boy Scouts that you can “wash” your griddle with sand and then simply rinse it. Try that with Teflon and watch it become worthless. I like the feel of quality cookware. Yeah, no backpacking it, you “drive” the heavy stuff into camp. Note: This is the only piece of aluminum cookware I will use. Otherwise, it is only stainless steel. 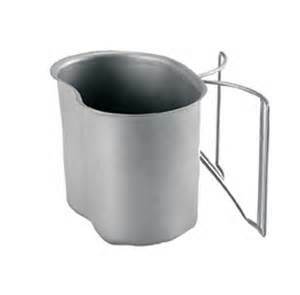 #2 Basic Cooking Utensil – 12 quart soup pot. You have to have a good old fashion soup pot. 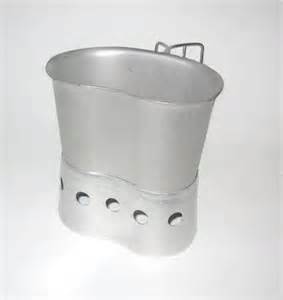 Of course you can cook stew and a wide variety of other foods in it but you will find this pot irreplaceable when need a large quantity soup or stew pot. There just isn’t another logical or convenient way to cook either. 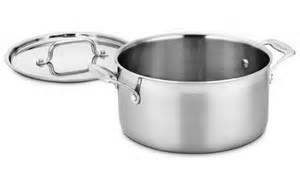 The best of the pots are Cuisinart or All-Clad. Either are the best of the best. Both are 18/10 Stainless Steel and good to 500 degrees. 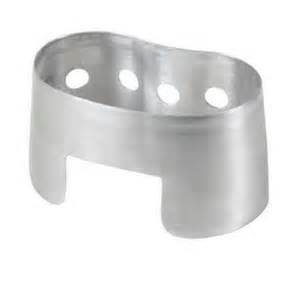 #3 Basic Cooking Utensil – GI Canteen Cup. I just love this thing! It is perfect for heating of water, then throw in your freeze dried entrée or your cocoa mix and you are good to go. You can also use the optional stainless steel cooker bottom as a stove & cup combo. For more information on this concept see the “Canteen Cup & Stove” section above. 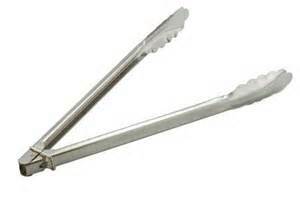 #4 Basic Cooking Utensil – tongs. Without question, in my not so humble opinion, the best possible emergency cooking tool is a good pair of long handled tongs. Go for quality here, the best quality you can afford, it will pay off. I like tongs that are 18” – 24” in length; I hate burning my hands on a campfire. 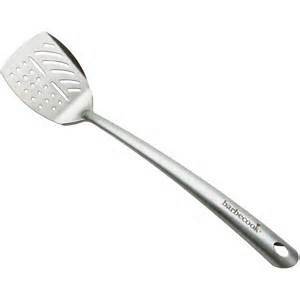 #5 Basic Cooking Utensil – spatula. I am not talking about some whimpy spatula, I want you to have a good quality solid long handled spatula. No wood! No plastic! Go with stainless steel only. 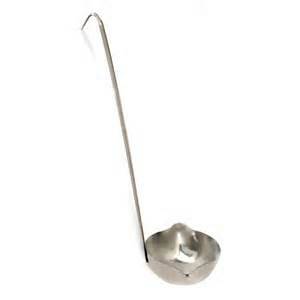 #6 Basic Cooking Utensil – ladle. I almost didn’t put this one in here because I am a guy – pour your soup or stew out of the pot and into your canteen cup! But, I figured my wife would appreciate me throwing in a little culture, class and sophistication into the pile. So once again; stainless steel, long handle, and a deep enough bowl to get a good helping for yourself. #7 Basic Cooking Utensil – GI Mess Kit. I am kinda torn on this one. I like em and I use em, but there are better options. However, for strictly being very useful, quality and convenient they are hard to beat. 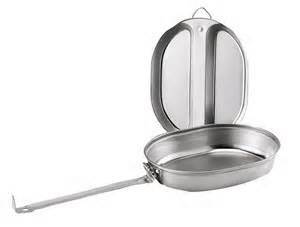 The pan with handle can cook just about any single portion of food that you can think of. But again, there are better options unless you need to fry something. 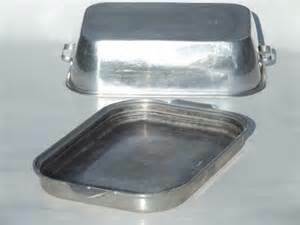 The two compartment top, or deep plate, is good to eat from but I always thought it made the food cold before I could eat it all. So this is not my first option for cooking & eating but it is my choice before a separate pan & plate.